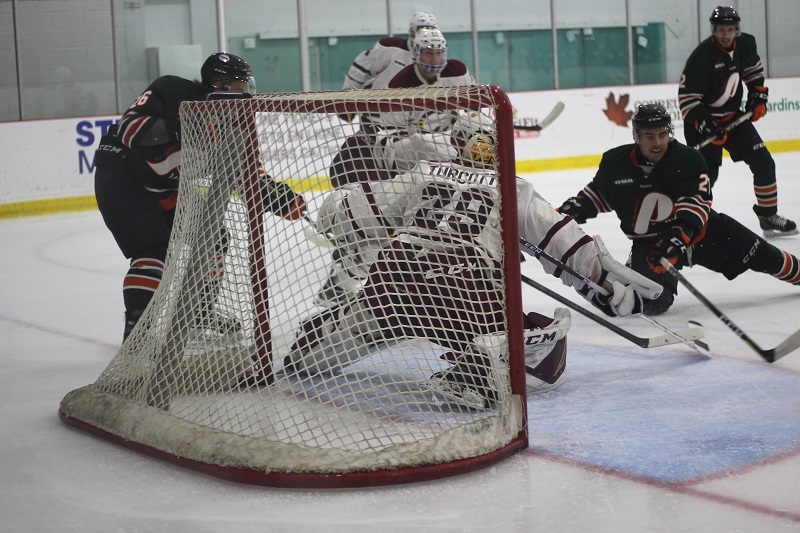 The Concordia Stingers men’s hockey team were defeated 3-1 by the Université du Québec à Trois-Rivières (UQTR) Patriotes at the Ed Meagher Arena Saturday night. It was a good game for the Stingers until the third period. They got numerous scoring chances in the first 40 minutes of the game, and led 21-19 in shots on goal after ttwo periods, but the score remained tied at zero. The Patriotes came up strong in the final period, with Christophe Boivin opening the scoring five minutes in. There were seven minor penalties in the game. Photo by Hannah Ewen. The Stingers’s lone goal was scored by defence Alexandre Gosselin on the power play. Gosselin’s goal midway through the third period evened up the game for just a minute before Mathieu Lemay scored the game-winning goal for the Patriotes. The Patriotes’s three goals were less than eight minutes apart, with Samuel Hould scoring the third goal. Élement said the Stingers’s mistakes in the third period determined the game’s outcome. Animosity and physical play increased throughout the game. The Stingers received three minor penalties, while the Patriotes received four. Stingers centre Chase Harwell missed nearly a period of play following a collision that caught him in the face during the second period. Harwell came back with a full face mask midway through the third period. The Stingers fall to a 1-2-0 record this season. Stingers goalie Marc-Antoine Turcotte finished the game with 34 saves. The Stingers will play the York Lions on Oct. 19, and the Ryerson Rams the following night, both at home.